"Oum Kalsoum, Fairouz and Asmahan -- whether one calls them princesses, queens or empresses, these three hold court above all in the categories of glory, power, legend and splendor. What female Arabic singer has never contemplated measuring herself against these Himalayas of her culture? 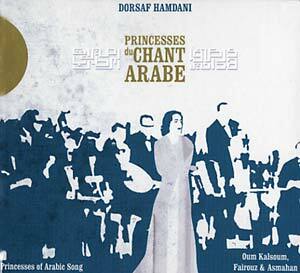 On this richly satisfying disc, Dorsaf Hamdani offers a fitting tribute to all three." Hardcover disc-booklet style packaging; Oum Kalsoum alone is one of the most enigmatic voices in the history of Arabic music and anything that so much as references her is more than worthy.